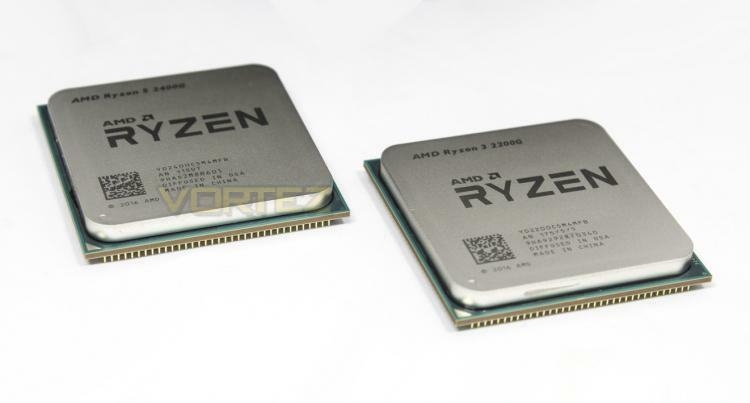 The 2nd Generation of AMD Ryzen kicks off with two Raven Bridge APUs, the 2200G and the 2400G, with the end aim of replacing the Ryzen 3 1200, and the Ryzen 5 1400. As a fusion of Zen+ CPU cores and Vegas GPU cores, the ultimate aim is to undermine the entry level discrete GPU market (up to $75), and offer a new benchmark in balanced, mainstream performance. Considering the CPUs they replace, you are effectively getting a strong GPU for the same price (or cheaper) than the CPU alone, along with the added benefit of having a genuine upgrade path to a discrete graphics card or 8core/16thread+ CPU thanks to being compatible with the existing AM4 ecosystem, with the potential base platform cost starting from around £120 for an A320 motherboard and the R3 2200G APU. The R3 2200G is a 4core/ 4thread part with a base clock of 3.5GHz and a turbo of 3.7GHz, it features the Vegas 8 GPU that features 512 ALUs (shaders) clocked up to 1100MHz. Alternatively the R5 2400G is a 4core/ 8thread CPU @3.6/3.9GHz, and features the Vegas 11 GPU (704 ALUs) clocked up to 1250MHz. Thanks to Precision Boost 2, each has a more responsive turbo boost, and as both are unlocked, they benefit from the granular 25MHz overclocking increments. The GPU cores too can be overclocked with an expected ceiling of around 1600MHz. Both Raven Bridge APUs now support DDR4 2933MHz natively, up from the 2666MHz of previous Ryzen CPUs. We note that the frequencies of both parts are higher than their former counterparts, but we also note that the R5 2400G only features 4MB L3 cache rather than the 8MB found in the R5 1400. This is because AMD chose to use 4cores from a single CCX, meaning that the extra cache no longer exists, and that the frequency boost compensates for any potential performance lost. Another note to make is that both APUs also feature a cut to the PCIe lanes, each having 8x, rather than 16x. This was likely to help reduce the cost and provide better value. This isn't likely to have any effect on mid-range graphics cards, but could hinder those that want to, for whatever reason, use these APUs with a GTX Titan xp. Though, pay attention to the storage maps in your motherboard manuals, as the reduction in PCIe lanes could potentially cause a conflict in the somewhat confusing storage maps (due to motherboards increasing their reliance on PCIe lanes) especially if your motherboard features several M.2 sockets.